This is our very first blog post and we are so excited to be on this business building journey with you. We’re starting this blog to educate, share knowledge, and let others in on the real world topics that small business owners want to hear and talk about. We’ve got a combined 30 years of experience and we’ve learned a lot the hard way. We’ll be sharing tips to help our clients better work with us, social issues that we deal with and real, relatable stories about running a business that most people don’t talk about. We also want to open a dialogue between business owners to vent, compare ideas, or just talk about anything related to the life of entrepreneurship.We want to dig into the nitty gritty of things. Working with family members, how entrepreneurship affects relationships and dating, managing schedules and kids. Everything! You can expect posts once a week and subscribers will gain access to exclusive deals, discounts, and our network of businesses. Let’s get started with who we are and how we came to be. BrandPolished started off as a husband and wife team. Richard Silverberg, an award winning Graphic Designer and Creative Director, co-founded the company with, then wife, Dorian Roberson. Richard’s 15 year design career combined with Dorian’s 10 year business and marketing knowledge gradually grew into a creative marketing agency geared specifically toward small businesses and serial entrepreneurs. The couple started in 2010 with Richard’s side freelance business run out of their den. At the time, Richard also worked as a full-time senior designer. Dorian, a SAHM (Stay-at-home-mom) to two children, supported the business with administrative work and client management. The idea for BrandPolished developed from the couple’s shared love of CNBCs show, The Profit starring super-entrepreneur, Marcus Lamonis. His business success formula (the 3Ps = People. Process. Product) really resinated with them. They were also touched by the background stories of the individual business owners. Having already worked with several business owners on their brands, they thought that all small business owners needed to look at their businesses with the same formula. They wanted to use their skills to help make that a reality for others – without Lamonis’ checkbook. Eventually, Dorian systemized Richard’s creative process and intertwined it with client and project management. With the help of new and emerging technology geared toward entrepreneurs and freelancers, she added business analysis to the mix and realized that they could turn into a sustainable business. 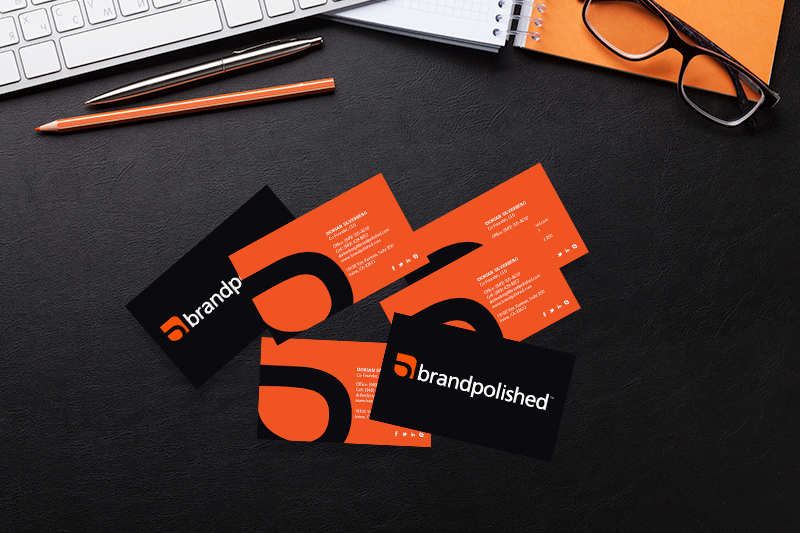 “We believe that any business can succeed by combining great branding, great people, and a streamlined process to deliver a great product.” BrandPolished incorporated in 2013 and now serves clients nationwide from their office in Irvine Tower. In 2016, the couple separated; but the company continues to thrive with Dorian at the helm. BrandPolished has grown to a 4 person team with the addition of COO, Angela Bibko and designer/developer, Janine Marie Cruz. As a full service marketing firm, they are small by design and only contract with a certain number of clients at a time. This means that every client is treated like a VIP regardless of how much they are spending. Cloud technology in conjunction with a bountiful talent pool of specialized freelancers keep client costs low and talent driven quality high. BrandPolished works with serial entrepreneurs, startups and small businesses with less than 100 employees in various industries such as DJs, Private Trainers, Comedians, Chefs, and Attorneys. They have 5+ years of experience working with startups looking to demo products and/or services directly to consumers. Additionally, startups pitching to investors for third and fourth round funding use BrandPolished for business planning and wow factor investor decks. As parents themselves, they also value time. Team members work remotely and collaborate via video chat. “We don’t believe in dictating people’s time and feel that people work better when they can work when they need to. We hate the idea of someone having to ask permission for doctor appointments or taking time off to care for children and family members.” They find this approach to be a long-term sustainable model allowing the entire team to do their best work. The company runs on a “show don’t tell” motto. Their advertising displays the final work they deliver to clients. They also connect, support and promote their clients on social media long after they’ve worked with them creating long-lasting relationships. Clients also benefit from the referrals they’re able to generate between themselves. The network of different businesses use one another’s services and refer business to each other. They believe in supporting small business by supporting others. January 2018 marked the 8 year anniversary of the company’s launch. They’ve maintained an A+ rating with the BBB (Better Business Bureau) for 5 years and were recently selected for accreditation.